Prepare cookies as directed on the Betty Crocker Gingerbread Cookie Mix package, mixing in 1 teaspoon vanilla with the egg, butter and water. Roll the dough into rounded tablespoon-size balls. Stuff one piece of chocolate into the center of each ball, enclosing the chocolate in the middle of the cookie dough ball. Place onto an ungreased cookie sheet. Bake 8 minutes. Remove from the oven and place a marshmallow on top of each cookie and gently press down. Bake 3 to 4 minutes longer or until edges are just set. Cool a minute or two. Serve warm. 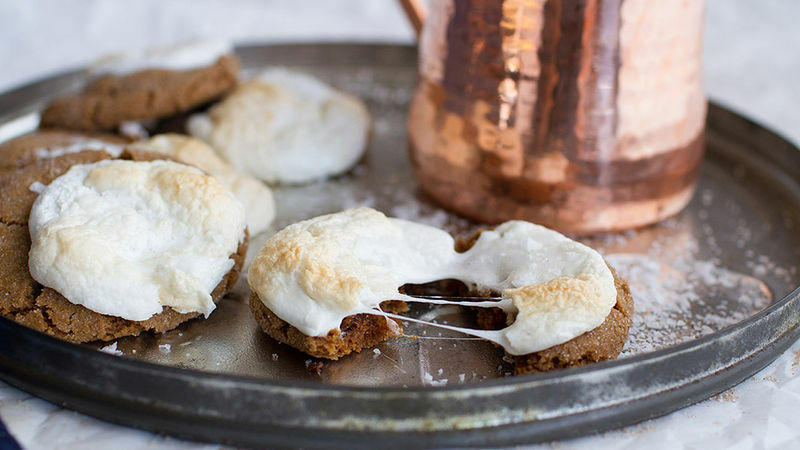 Try sprinkling the top of each marshmallow with a little pumpkin spice or cinnamon.